IN HIS PRESENCE is the theme of this quarterly concert since the first edition on 30th August, 2013 in Lagos, Nigeria. Venue: Alberta Event Centre, By China Town, Ojota-Ogudu Exp/way, Lagos. Expect PRAISE, WORSHIP, WORD, PROPHETIC MINISTRATIONS & FREE DISTRIBUTION OF THE MANTLE OF THE UNCTION OF GOD in His presence. It will be an evening of extravagant Praise and awesome worship IN HIS PRESENCE. 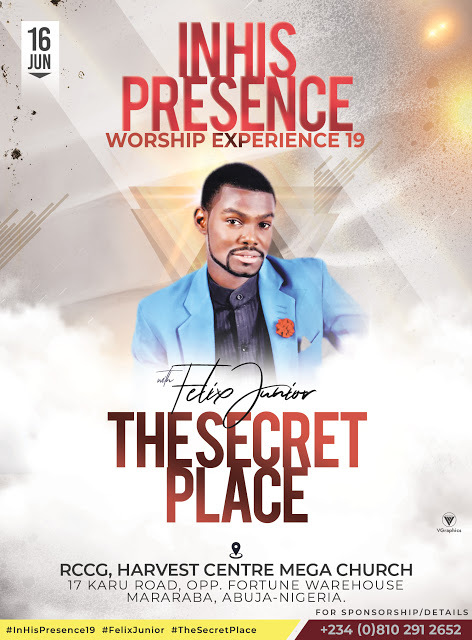 It’s more than a concert, it’s an encounter! You can’t afford to miss it. Please, note that the date and time have been shifted to 30th August, 2015 and 3:00pm respectively to mark exactly 2 years that we started this covenant non-denominational meeting. http://www.facebook.com/events/893583934035742/ and press the “going” botton or text your full name to 09036334502. It’s more than a concert, it’s an encounter! text your full name to 09036334502.